I must say, I’m in love with this quilt! I made it on a whim, after seeing so many people working on the Marcelle Medallion quilt from Alexia Abegg’s book, Liberty Love . As I mentioned before, I decided to use a portion of her pattern – the 7th border – and use those pluses to make up my entire quilt top. I enlarged the block just a bit to make the pluses stand out even more and raided both my stash of brightly colored prints for the pluses themselves, and my stash of low volume prints for the background fabrics. And how fun, right? Alexia has a great pattern here, and I love that I could find inspiration from her quilt to make up something I absolutely love! I thought I’d concentrate the quilting around the pluses, but a quick survey on Instagram said straight line quilting, so straight line quilting it was. I went with horizontal lines this time around and again did some random spacing about 1/4″ to 3/4″ apart. The backing is a print from Aneela Hoey’s Sew Stitchy line (great sale prices here, by the way! ), and then I used the gray crosshatch from Carolyn Friedlander’s Architextures line for the binding. I decided to use one of the low volume prints for binding since I wanted it to blend in with the background, allowing the pluses to be the only bold bright spots. 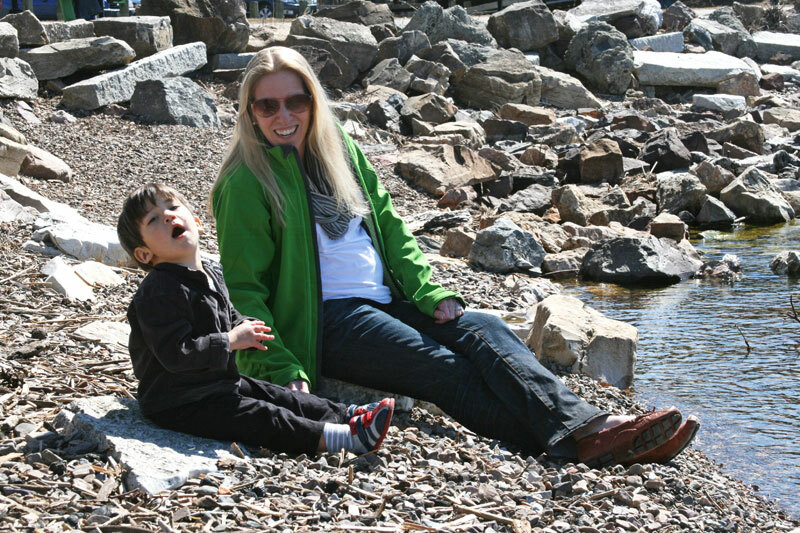 We lucked out with a really lovely day on Saturday and found ourselves down at the beach to throw stones in the lake (Max’s favorite pastime!). 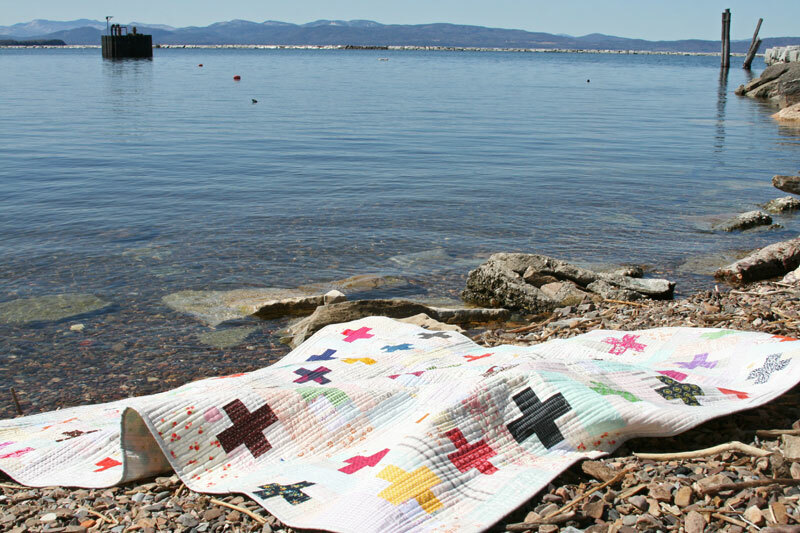 It’s so nice to start to see signs of Spring again – I do love quilt photos at the lake! This entry was posted in [search] Other Quilts, Fabric, Posts about Quilts, Quilts and tagged handmade, Liberty Love, low volume, marcelle medallion, plus quilt, quilt. Bookmark the permalink. This is so beautiful! The straight line quilting is perfect on it, too. I have so many plus quilts pinned on Pinterest; I have to make one some day. Great quilt, Ashley. How long did the straight line quilting take? just curious. I love this quilt so much – from the moment I saw it on an earlier Post. I would love to pay for a pattern please? After seeing your low volume, plus popping, wonderful quilt you have sealed the deal. 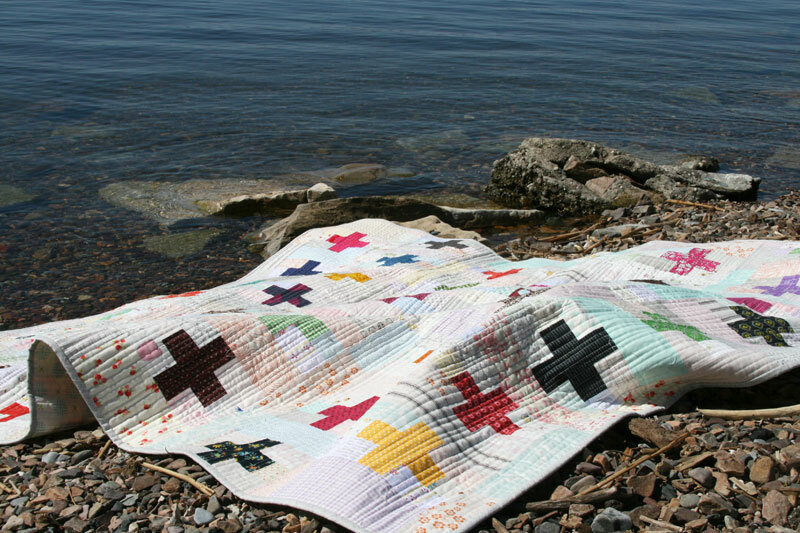 I have been fluctuating about all the plus quilts lately. I want to make one. Thank you for the inspiration! Yours is lovely! I absolutely L.O.V.E. this!!! I love how the pluses stand out and I really love the background colors- sooo pretty!!! Such a cute pic of you and Max! Spring is trying to arrive here in Ohio too! So anxious for nice weather! love it! the bright plus signs against the low volume bg just makes my heart sing! 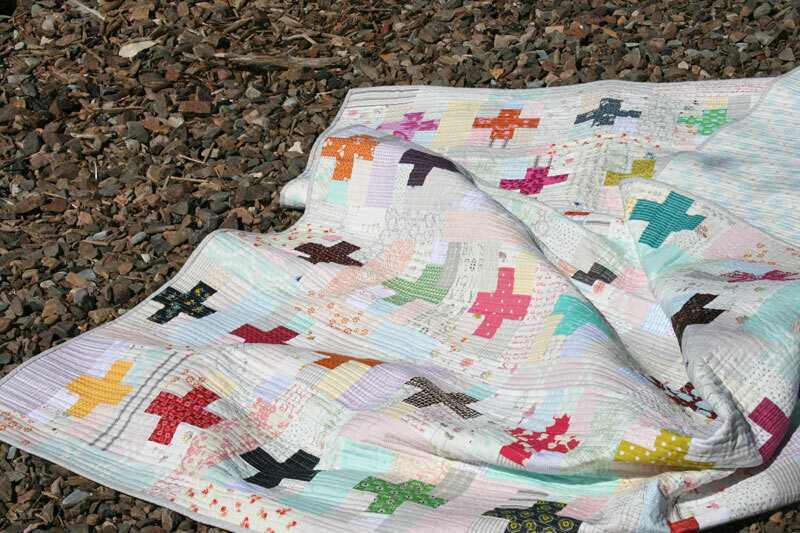 I really do like this quilt too, the combination of brights and low volume is inspiring me……. Love the lake back ground…. Definitely one of my favorites of your quilts. The quilting is exactly right! 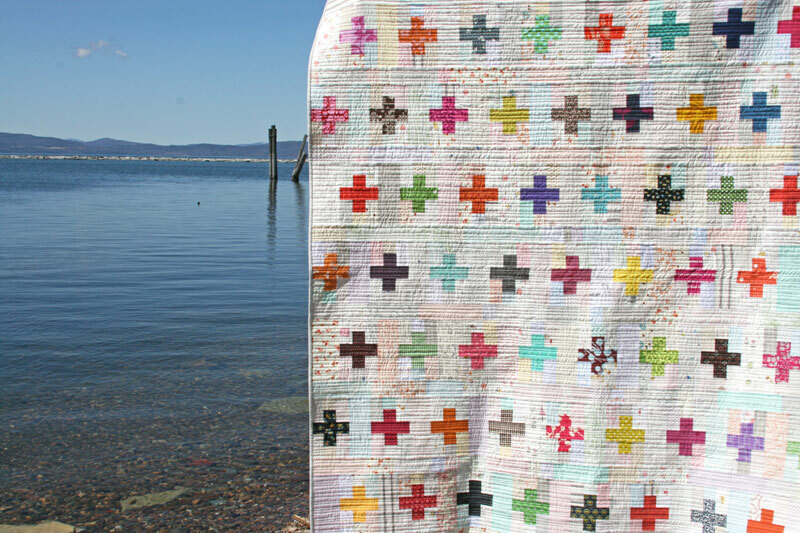 I can see why you are in love with this quilt and clearly you are not alone! 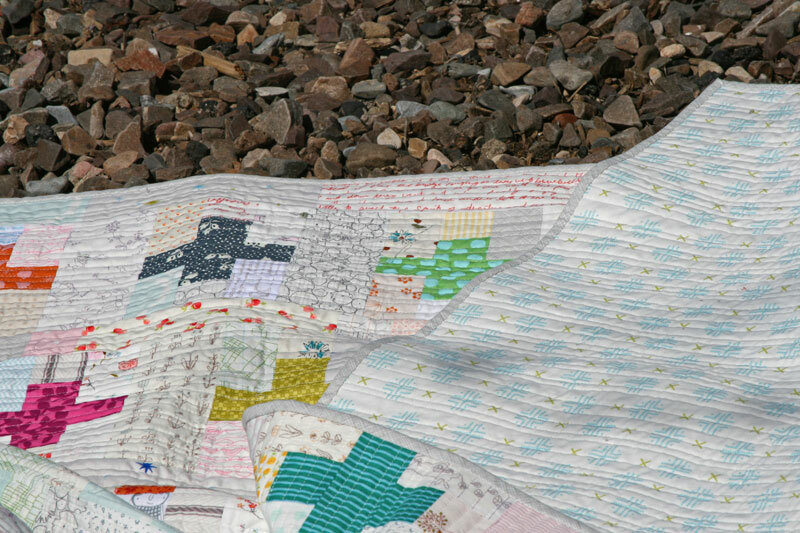 It is a wonderful blend of modern and old-fashioned and the quilting is the icing on the cake! You really did a terrific job. It reminds me of the quilts Grandma made and I would love to snuggle under this one on a cool spring evening! Well done you! It is a beautiful quilt. And the quilting is just perfect. It is one of the prettiest plus quilts I have seen. Great job! I like so many of your quilts, but this has to be one of my very favorites!! Thanks for sharing such great pictures. I’m in LOVE! I absolutely love this quilt, the pale background is just right. And your photos are fantastic. I just tried taking good pictures of a quilt, and it is nowhere near as easy as you make it look! You look really great, hope you are feeling well too. Love this so much, Ashley! So pretty. Your quilt pictures are so lovely. It’s nice to see you and Max enjoying the day by the lake. Definitely one of my favorites, and now it’s on my to-do list. Would LOVE to have a pattern or just a list of measurements. Love your quilts! Great inspiration. And, I love Burlington, Vermont. I hope to visit the new quilt shop, Nido, that you mentioned, too! Thanks for sharing your terrific quilts. I love this quilt! Therefore, I have started one of my own. Not sure is it will turn out as beautiful, but I certainly hope so! Did you straight line quilt on your home machine?